A couple of years ago we contacted you looking for plans to build a tournament style ski boat. 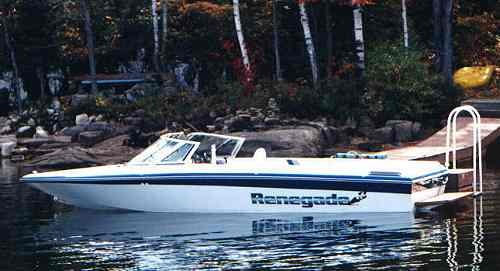 The closest hull you had to offer us was the Renegade. We liked the hull shape but thought the boat in general had a dated look. We purhased the plans from you and it took a whole year to finish the boat. I am sending you a couple of pix to show what we did to the plan. 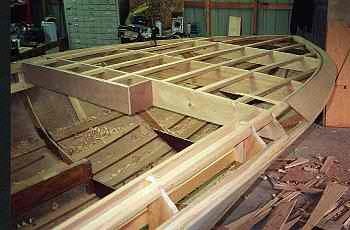 We followed the plans exactly to build the hull to the deck line and then put our own idea of what we thought a more modern deck should look like. We used a straight inbourd installation useing a 350 Chev engine 265HP. and a Borg velvetdrive hydralic transmission. We built the boat strickly for the purpose of watersking so the seating might not appeal to everyone. I am sending you a couple of photo's of the boat, if you wish more we have a complete set of pix as we built it following most steps. If anyone is interested in this type of boat we would be glad to send them photo's and give them any assistance that we can. You can give my e-mail address to anyone interested.